Squeals of excitement ripped the air, as the little Zulu children were given apples to eat. A strange tasty fruit they had not seen before. A crowd of spectators gathered around and watched in amazement as three American Caucasian children worked alongside native Zulus. The children’s ‘colored mother’ had to patiently answer myriad questions, because this had never been witnessed before. This was a country where the stronghold of apartheid held over decades, has recently been demolished. Little Aaron Olson all of seven was engrossed with helping mix concrete, high on top of a hill in Malangeni for Sakhile Chili. He was happy to be part of a team, along with his two brothers Eric (9 years) and Ian (13 years). Helping to build a spaza shop, (This is a small convenience shop in South Africa, in which everyday small household items are sold). Ian and Eric Olson helped remove a truck of rubble in a small wheelbarrow, up and down a rickety steep road connecting houses in the hill. 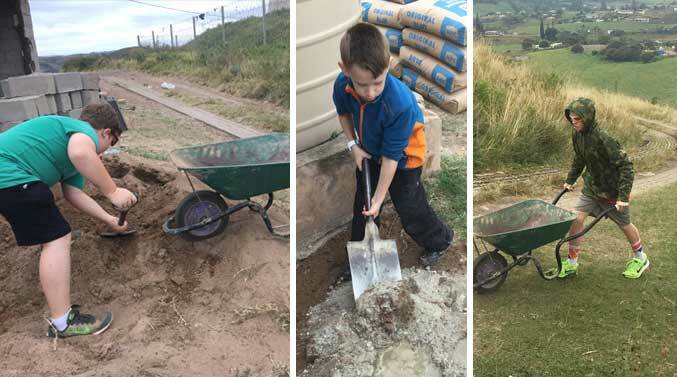 The three boys helped in mixing concrete, laying bricks for the wall and removing rubble. Gathering Together had planned this trip to South Africa to build a spaza shop for Sakhile, who lives in a small match box house on top of a hill, in a government settlement for poor Zulus. The settlement houses over 500 match box houses. The view from the house, on top is one of panoramic splendor. A sad testimony not just to the beauty of creation, but the huge divide between the haves and the squalor of poverty in which have-nots live. Sakhile Chili, the Africa Coordinator for Gathering Together, chooses to live in this poorest of poor segments, serving his people. Water is available at the bottom of the hill and families have to carry water up hill for all their needs. Gathering Together encourages families to visit our projects and work together with us, during our trips. This enhances the love between family members and strengthens sibling bonding. No child is too young to be part of our team!! This helps build strong values in children. A total of 39 members made the trip to visit South Africa. Most of them were from China led by Esme Warne, who is the South Africa Coordinator for Gathering Together. They visited Seven Rivers farm, Kelso Creche and Umdoni Christian Academy. Fun activities were planned to keep youngsters and adults enjoy the trip while they served. Trip members were engaged learning Zulu steps where the foot is stomped on the ground making a noise. It is beautiful to hear them in harmony! Trip members and our Zulu friends sang together and danced together, learning each others cultures and learning to appreciate one another’s culture. Are you looking for a vacation where you can have a time of fun and bonding with family members? Are you looking for ways to serve the underprivileged and teach your children to do the same? You are welcome to join our trips. If you are not able to come for a trip, but would still like to reach out to the poor and underprivileged, please do send us a donation.